If you use Google Analytics for your ecommerce business, Google Analytics: Understanding Visitor Behavior by Justin Cutroni (blog) is a great resource (provided you already have a general understanding of basic web analytics). It covers a broad range of applications including creating an implementation plan, how to use profiles and filters, marketing campaign tracking, CRM integration and enterprise implementation. With permission of O’Reilly Media, this post is an excerpt of the “Common E-Commerce Problems” section of the book (pp. 128-129). If the data in the product performance reports (particularly the Product Overview and Product Categories report) is garbled or contains extra characters, there may be an issue with the data in your hidden form. Verify that the transaction line and product lines contain only alphanumeric characters. Monetary data should not include a dollar sign or commas. This is a common problem for websites using a third-party shopping cart. The problem is normally not the implementation of the e-commerce tracking code. It is more likely that the cross-domain tracking is incorrect. A simple way to identify the source of this problem is to examine the data in the All Traffic Sources report. Use the E-Commerce tab to identify which traffic sources are driving revenue. If your website’s hostname is listed in the report, there is probably an issue with the cross-domain tracking. It is not uncommon for some transactions to be missing from Google Analytics. This usually occurs when visitors navigate away from the receipt page before the data is transmitted. If the number of transactions in Google Analytics is off by more than 10% when compared to your accounting software, there may be a bigger problem. In general, Google Analytics should be tracking most transactions. If there is a significant number of transactions missing, double-check the implementation. You may want to move the e-commerce code to the top of the receipt page so the data is sent to Google Analytics immediately as the page loads in the visitor’s browser. E-commerce tracking may not be feasible for all third-party shopping carts. If the shopping cart provider does not permit modifications to the receipt page, the standard implementation of e-commerce tracking will not work, and you should try a workaround. Each shopping cart is different, so there is no single workaround that will solve every problem. A quick search of your shopping cart provider’s support documents should point you to the integration instructions. As of March 2010, the standard e-commerce implementation process will not work with Yahoo! stores. There are various companies that charge a monthly fee to integrate Yahoo! store e-commerce data and Google Analytics data. I’ve used Monitus’s Web Analytics Connector (http://troni.me/9PcS1E). Its service connects your Yahoo! store data with your Google Analytics data. Monitus charges a monthly fee for this service based on the number of pageviews your site generates. If you’re using a Yahoo! store, you should consider using the Yahoo! service. There can be two causes for inflated revenue numbers in Google Analytics. The first cause is usually people bookmarking the receipt page and visiting multiple times. The only way to resolve this issue is to add some type of logic to stop the e-commerce code from executing when the receipt page is accessed directly rather than as part of a transaction. Another cause of inflated revenue data is canceled transactions. Google Analytics collects e-commerce data when the receipt page renders in the visitor’s browser. If the transaction is declined or modified at some point later, these changes will not be represented in Google Analytics. The only way to modify transactions in Google Analytics is to erase the transaction by submitting a duplicate transaction with a negative value. While this will eliminate the revenue from the transaction, it will not eliminate the other information associated with the transaction. This is the only way to remove a transaction from Google Analytics. You can pick up your own copy of Goolge Analytics: Understanding Visitor Behavior from your favorite bookstore or Amazon. Or, follow the author on Twitter @justincutroni. 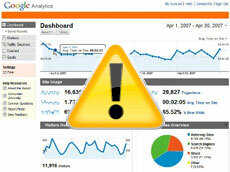 8 Google Analytics Sins: Are You Guilty?